Success in the kitchen is all about planning ahead – from making shopping lists to weekly meal plans to thinking about special meals weeks in advance. Today we’re sharing a recipe idea for affordable sweet gifts for your valentines that you can prepare well before February 14. Or maybe you hate Valentine’s Day? 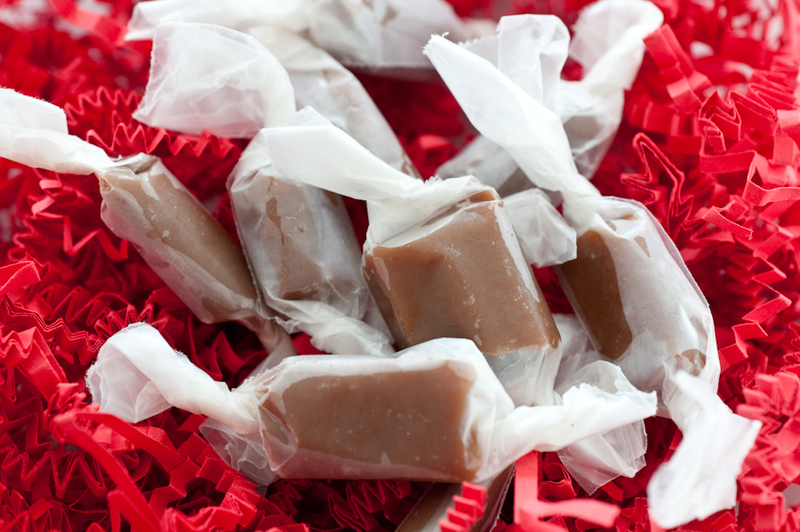 Well, a few of these sugary caramels will make you forget all about the “Hallmark holiday” as you revel in the harmonious combination created by sugar, corn syrup, heavy cream, butter and salt. If you’ve never caramelized sugar before, it can be tricky and making candy takes patience (and a thermometer), so making this recipe well in advance is advised. Lightly brush an 8×8 glass pan with oil (or line it with parchment and oil the parchment paper if you prefer). Bring the following ingredients to a boil: 1 cup heavy cream, 5 tablespoons of melted butter cut into pieces, 1 teaspoon sea salt (we used Maldon). We boiled them in a small saucepan and then set aside. In a larger pot, at least 3-quart capacity, boil 1 ½ cups granulated sugar, ¼ cup light corn syrup and ¼ cup water and stir until the sugar dissolves. Once the sugar dissolves, swirl the pan until the sugar reaches a golden brown color. Now for the fun part! If you have kids, this would be fun for them to watch, but make sure they stand back from the stovetop. Stir the cream mixture into the sugar mixture and watch it bubble! Stir the mixture almost constantly for 10 or 15 minutes until the thermometer measures 248 degrees. Pour into pan and let cool completely for at least a couple of hours. Cut the candies and wrap in wax paper squares. Make sure not to let the candies you’ve cut into pieces touch one another before you wrap them or they will melt together. This recipe comes to us via Rebecca Nolen, an Every Food Fits reader and designer for EveryFoodFits.com. Rebecca found this recipe on Design Sponge, which also includes instructions to make an origami gift box for your caramels! We put them in candy bags and tied them with ribbon. These delectable candies fall into our “Sensible Indulgence” category. Simply stated, we avoid deprivation, while remaining aware of portion sizes. Pair a few of these sweet, creamy, and chewy treats with some squares of dark chocolate for a decadent, yet satisfying dessert. Melt a few candies atop some ice cream, or tear off the paper, and dig right in. A few at a time is certainly reasonable, and could easily be included as a dessert with lunch or dinner. Most of all, enjoy! What’s your favorite Valentine’s Day treat? Do you celebrate the holiday…or try your best to ignore February 14? For a few years we got sushi takeout on VDay–low key, easy for a weeknight, but still sort of a treat because we love sushi and no one had to cook or really clean up. Last year I ditched my husband and was on vacation with his sister on VDay. Oops? Thanks, Stacey! So glad you enjoyed these. I don’t know if I mentioned it, but I use a pizza cutter sprayed with cooking spray to cut them, and it works really well.